In front, you have the harpoon man and your oarsman. Today you have your gunner. You have an oarsman and the guy who handles the float. He’s also an oarsman, but he tosses the float out. You have the two oarsmen in the back, normally two heavier people. And in the far back you have your steersman, your aquti. A paddled skin boat or one under sail is quiet and does not startle whales and other animals; water lapping on its hull sounds almost like another living creature in the water. The umiaq is a large boat up to 35 feet (10.7m) long, the size needed for a whaling crew and all its gear including floats, lines, harpoon (darting gun), and bomb gun. 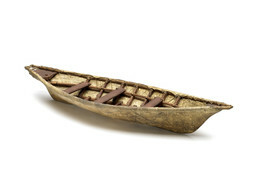 The requirements are similar for walrus hunting, and the boats are used for that purpose as well. A boat captain (umialiq) holds a position of leadership in his community.